Seasteading is the idea of "floating cities," or permanent liveable areas in international waters. Modern seasteading is largely the brainchild of two people: libertarian political economy theorist Patri Friedman and engineer Wayne Gramlich. 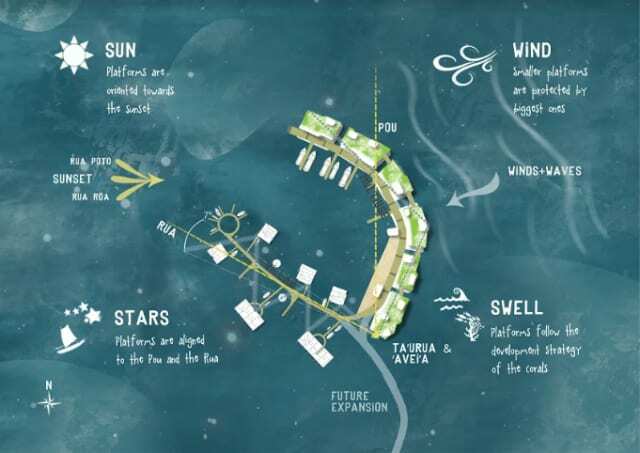 In 2008, the two men joined forces to establish The Seasteading Institute (TSI), a not-for-profit that facilitates and promotes the creation of seasteads. The institute picked up steam after an investment from entrepreneur Peter Thiel, currently most famous for founding data-mining and surveillance company Palantir. Over the course of his partnership with TSI, Thiel invested $1.7 million dollars in TSI. Driven closer to shore by the prohibitive costs and difficulties of mid-ocean parking, TSI launched The Floating City Project—aimed at creating a city within the bounds of a country's territorial waters—in 2013. Three years later, TSI met with officials in French Polynesia to work on cocreating a legal framework for a separate floating city to exist in a special economic zone (SEZ) within its borders. After both parties signed a memorandum of understanding in 2017, TSI also launched for-profit Blue Frontiers to build and operate the seazone. And then the project abruptly sank. In March 2018, French Polynesia decided to back out of its deal with TSI, stating that their agreement had expired at the end of 2017. "It's not a contract," ruling party Tapura Huiraatira said in a post on Facebook. "This document does not bind the Country in any way. It has no legal value." Blue Frontiers hasn’t publicly acknowledged that the deal has fallen through. Its site still advertises the French Polynesia project, and dismisses opposition to it as one voice among many. And speaking to CNBC last year, self-proclaimed "seavangelesse" Nathalie Mezza-Garcia talked about the project without any mention of government difficulties. "There is significance to this project being trialed in the Polynesian Islands,” said Mezza-Garcia, while failing to mention that the project may not go forward in the Polynesian islands at all. Still, some of seasteading’s top talent has migrated onward. Entrepreneur Marc Collins, cofounder of Blue Frontiers, went on to found Oceanix. The company’s goal? Work a little more closely with government powers in order to get floating cities off the ground—or, off dry land. Oceanix City is designed as a collection of 4.5-acre hexagonal platforms that hold about 300 people each. A group of six platforms will be designated a “village,” and a group of six such “villages” will be designated as a city. These “cities” can be made more livable by rearranging the platforms. The design will be recognizable to anyone who followed TSI in the past. 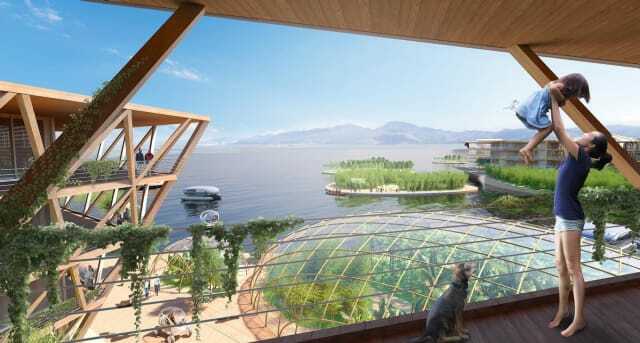 While seasteaders never had a unified vision of what these cities should look like, TSI has favored the floating module structure proposed by Dutch company DeltaSync in its 2013 report on the subject. In the report, DeltaSync emphasized what it believed were the six most important objectives of the project: movability, dynamic geography, growth, seaworthiness, safety, and the residents' ability to "experience" the water (through activities like swimming and through a clear ocean view). For each objective, DeltaSync listed potential designs that would emphasize the objective, along with their pros and cons. The company’s final vision, the one it decided would be most practical, was a city of 11 reinforced concrete platforms, either squares or pentagons with 50-meter (164 ft) sides. The platforms would be caissons, or hollow boxes, reinforced by "ribs" to carry the load of the water pressure to the walls. 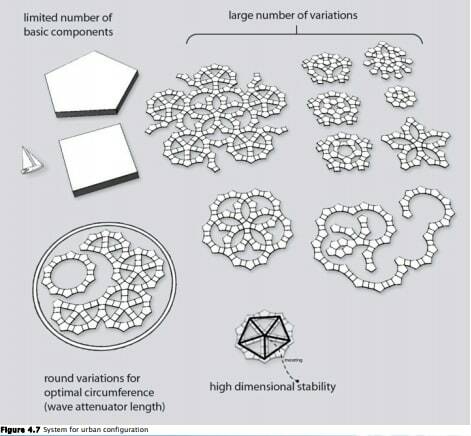 The modular nature of the platforms would let "citizens" rearrange them to create more efficient city layouts. Some of Oceanix’s living solutions—like “ocean farming,” where cages under the platform harvest sea life—are borrowed from the old DeltaSync design, but some of them are entirely the proposal’s own. Oceanix is designed to be anchored to the ocean floor with biorock, a limestone coating created by exposing underwater minerals to an electric current.And unlike the old seasteads, Oceanix is meant to be permanently anchored no more than a mile from shore—a concession to the difficulty and expense of building on the open ocean. Both the UN and Oceanix seem enthused about their partnership. "Everybody on the team actually wants to get this built," Collins said. "We're not just theorizing." But the question remains: how many of seasteading’s problems have actually been solved, and how many of them are still lurking under the waterline? The new initiative does solve one of the biggest problems with the old concept of seasteading: the lack of government buy-in. While the old seasteads were seen as independent city-states, the newer generation are meant as extensions of preexisting cities, bound by the same laws. The change means these latest proposals are much more likely to find a willing partner. But the practical limitations still remain. 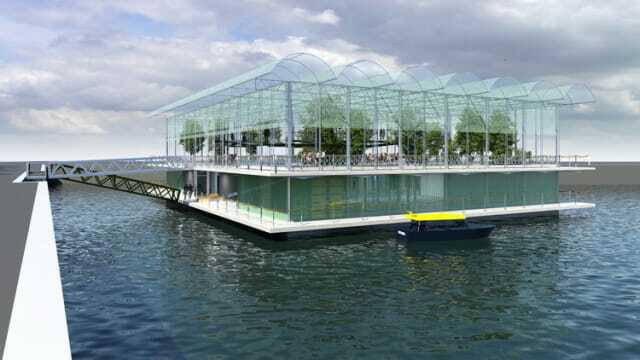 Currently, the largest "floating city" project in the works is a floating farm in Rotterdam, soon to be home to 40 dairy cows. Backed by the Dutch company Beladon, the farm began construction in summer 2018, when a 900-ton concrete platform was towed into the city's Merwehaven harbor. The farm is planned to be sustainable, humane and beautiful. But looking at the renderings, it is immediately obvious that it's also small, and very closely linked to the land. 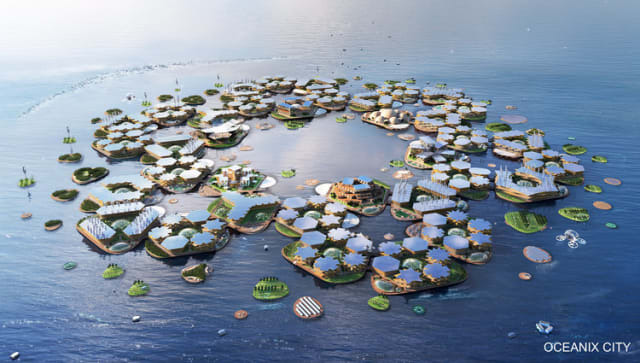 By Bjarke Ingels’ own statistics, “9 out of 10 of the world’s largest cities will be exposed to rising seas by 2050.” That leaves engineers less than 30 years to figure out how to turn the floating farm into a floating city that can be home to millions of people and the infrastructure needed to sustain them instead of 40 cows. Then, there’s the problem of cost. It’s difficult to estimate the exact cost of Oceanix, given that the idea is still in its very early stages. But when DeltaSync planned its city back in 2013, the company included a cost estimate. Each of the plan’s concrete platforms would cost approximately $15 million each, meaning that the cost of the entire city (which was to house 225-300 full-time residents) would be approximately $167 million. Scaled up to the 10,000-person Oceanix City, and the idea starts to look a lot more expensive. And that’s just the cost of the platform itself. One of the major infrastructural costs of living in an isolated community is transportation, whether that’s the transportation of people or the transportation of goods and materials. Oceanix City plans to transport its waste in pneumatic tubes, and its people by autonomous vehicle. Still, the problem remains: transporting people, goods and waste to and from the shore is going to be expensive. Of course, one possible solution to such high costs is to have Oceanix function as its own sequestered community, with all of its own separate amenities. But that solution touches on one of the biggest problems with the floating city: public perception. The problems that TSI faced in French Polynesia were as much about public perception as they were about government distrust. The island’s government broke its partnership after widespread local resistance surfaced, lead in part by local radio and TV host Alexandre Taliercio. “How would a new tax-free zone … have the potential to change the face of our economy?” Taliercio asked, echoing many who were suspicious about a foreign “nation” living inside the country’s borders. Ironically, one real-world application of the floating city concept has turned out to be exactly the opposite. Because of skyrocketing Silicon Valley rents, San Jose has a homeless population of approximately 7,000 people. Mayor Sam Liccardo is looking at a range of possibilities to make the city more livable, including creating a floating apartment complex to house the city’s homeless. If the plan goes ahead, the city will develop on the swampy land at its north end. Part of it is an ingenious solution to climate change and rising waters; if the ocean rises, the development can rise with it. But in part, it’s the city’s attempt at finding a solution for a population that many people don’t want to be around. In the past, Liccardo has struggled to find a welcoming place for the homeless in his city. "It doesn't matter whether it's tiny homes or permanent housing," said Liccardo. "There's a constant challenge in identifying locations where a neighborhood nearby is not going to say, 'Not in my backyard.'"